I slept late (I've been doing that a lot since I semi-retired) and pretty much abandoned my Halloween plans because I would be getting such a late start. So I performed my normal morning routine, then sipped a cup of coffee while reading the newspaper. My wife and I always read our daily horoscopes to each other for amusement, but when I read mine, I was enthused rather than amused. So I put down the newspaper, took my cup of coffee to the bathroom, set up my makeup mirror and began doing my makeup. 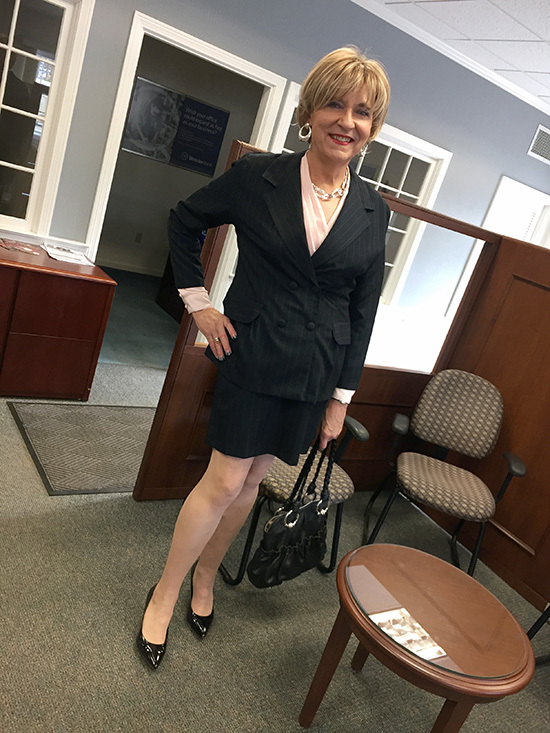 Ninety minutes later, I completed my transition and looked very business-like wearing a vintage pinstripe suit that I bought on eBay almost 20 years ago. I was on the road at 11 AM and made my first stop only 2 miles away at the hair salon where I have been getting my hair cut for over 25 years. Two years ago, I was getting my hair cut after Halloween and my hairdresser, Miss D, asked if I did anything for the holiday. So I pulled out my iPhone and showed her my en femme photo. She was floored and could not get over it, so I decided to let her see my femulation in person this year. I entered the salon and Miss D greeted me without a glimmer of recognition. I played along and said I wanted to make an appointment with my regular hairdresser, Miss K. Miss D opened the appointment book and found an opening that I could fill, then she asked my name (to enter into the book). When I told her my boy name, her jaw dropped and the "Oh, my God's" began flowing without interruption. Just then, another hairdresser, Miss C, showed up for work and she was flabbergasted, too. Miss D had to return to her station to attend to a customer, but Miss C hung back and agreed to take some photos with my iPhone including the one that graced my blog yesterday. Next stop was my bank, where I usually do my business via the drive-through window. Since I was cashing a check and making a withdrawal, I would have to show my I.D. (my driver's license) and there might be some confusion considering how I appeared, so I went indoors rather than driving through. As I entered, I saw three women staffing the bank — I have done business with all three of them for a number of years, usually at the drive-through window and occasionally up front and personal. I greeted the woman who was seated typing away at a computer in the cubicle just inside the bank entrance. She looked up from the computer and was clueless. I smiled and said, "Happy Halloween! You may know me better as [insert my male name]." I believe she heard me, but I think she could not believe her eyes and asked, "Who?" I had to repeat my name a couple of times before it sank in and she said, "Wow — you look fabulous!" "Thank-you," and I proceeded to get into the line waiting for my turn at the teller, who greeted me with a big smile as I queued up. The third woman was staffing the drive-through window and did not seem to recognize me. When it was my turn, I walked up to the teller, who greeted me so profusely that I knew she knew who I was. "You look lovely today," she said. "You know who I am, don't you." "I recognized you as soon as you walked in." There were no other customers in the bank, so my teller called over the other teller and asked her if she recognized me. The other teller did not have a clue. My teller tried to clue her in with this hint, "Who has a green car and always uses the drive-through window?" The other teller was still clueless. Another clue, "Who has a little friend (my dog) in the passenger seat?" My teller finally showed her my driver's license and the other teller shouted out my male name followed by a series of question marks and exclamation points. She was amazed and gushed over my "disguise." I asked my teller if she would take my photo and she said she would love to do it, so I handed her my iPhone and she took a half dozen shots including the one above. I said my goodbyes and as I passed the cubicle where the first woman was working, she stopped me and went on and on about how convincing I looked. I mentioned how my wife always said that I would never pass because of my large size. "Oh, no," she retorted, "No one would ever guess that you're not a woman." 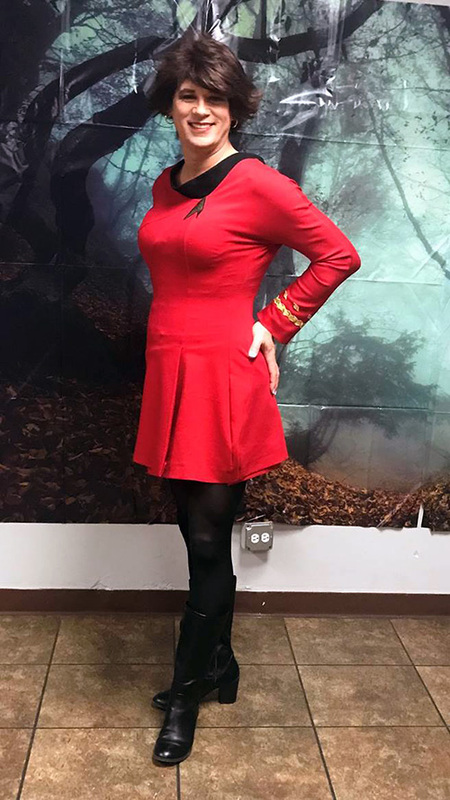 Christina Marie Mirka femulating on Halloween in a female version Star Trek Scotty's uniform that Christina created from a dress pattern. Absolute confirmation across the board. You looked marvelous. The most mundane errands become fun adventures when I go out skirted. I went out to lunch with my best friend the other day. 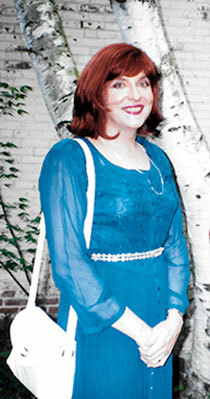 I was wearing a Calvin Klein fit &flare dress with patterned tights and Mary Janes. My friend was very supportive and happy for me that I’m finally getting out and doing regular things wearing the clothes I love so much! 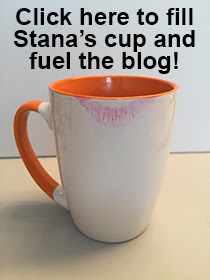 I can’t thank you enough, Stana, for the wonderful example you have set for me. I am who I am and I am proud if who I am! You are welcome. I am happy for you, Andy. “No one would ever guess that you're not a woman.” Well said! I'll be on cloud nine if anyone ever said that to me, especially another woman!